This set of Linear Integrated Circuit Multiple Choice Questions & Answers (MCQs) focuses on “Thin Film and Thick Film Technology”. 1. 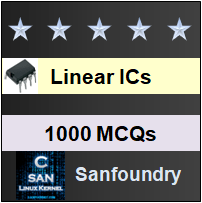 When does an integrated circuit exhibit greater degree of freedom and electrical performance? Explanation: Combining films and semiconductor technology provide a better electrical performance than either technology can provide separately. Explanation: Thin films have thickness varying from 50 Å to 20,000 Å. =>therefore, the thickness range from 0.02-8 mmil. 3. Which technology is used to get cheap resistors and capacitors? Explanation: Thick film technology produces cheap and rugged components, whereas thin film technology provides greater precision in manufacturing but is quite expensive. The processing equipment for thick film circuit is relatively inexpensive and is easy to use. 4. How is the process of film deposition carried out in cathode sputtering? Explanation: Cathode sputtering and vacuum evaporation uses identical system. However, the process of film deposition in cathode sputtering is slower than evaporation method. Since depositing a micron-thick film takes minutes to hours, compared to seconds to minutes for evaporation. 5. How a uniform film with good crystal structure is attained in cathode sputtering process? Explanation: The process of cathode sputtering is performed at a low pressure (about 10-12 torr). So, when the high energy particle landing on the substrate actually results in a very uniform film and adhesion. 6. Which process is used to deposit metals on glass, ceramic and plastic? Explanation: In electroless plating, a metal ion in solution is reduced to the free metal and deposited as a metallic coating without the use of a coating without the use of an electric current. Thus, this process is used in plating on glass, ceramic and plastic. Explanation: Electroplating is a process of coating an object with one or more layers of different metal. When dc is passed through the electrolytic solution, the positive metal ions migrate from anode (metal) and deposit on the cathode (substrate). Explanation: Silk screening is one of the processes of thin film technology. Explanation: The process of screen printing pattern is an ancient one. The Egyptian used this technique thousands of years ago to decrease potter and wall of building. 10. What is the advantage of using Surface Mount Technology? Explanation: Surface Mount Technology utilizes micro-miniature leaded or leadless components called Surface Mount Device (SMD) which are directly soldered to the specified areas on the surface without hole. Also, the compact size of SMDs reduces the area in PCB and increases the packing density.